The contents of a letter sent on 29 October 2005 by the Iranian Armed Forces’ Command Headquarters to a number of governmental agencies has been made public and is available from the Baha’i World News Service. The letter asks the agencies to assist in preparing a “complete report of all the activities” of the Baha’is “including political, economic, social and cultural” for the purpose of “identifying all the members” (quoted from an English translation of the letter). In March the United Nations Special Rapporteur on Freedom of Religion or Belief, Ms. Asma Jahangir, stated that she was highly concerned about this letter – addressed to the Ministry of Information, the Revolutionary Guard and the Police Force – which states that the Supreme Leader Ayatollah Khamenei had instructed Command Headquarters to gather this information. Ms Jahangir said that this constituted “an impermissible and unacceptable interference with the rights of members of religious minorities” and was concerned that this would form the basis for the increased persecution of the Baha’is in Iran. Disturbuing evidence has also been found of the extent to which the Iranian authorities are carrying out this instruction. The Baha’i World News Service has a copy of a letter (and English translation) dated 2nd May 2006 instructing the Iranian Union of Battery Manufacturers to provide a full list of Baha’is in the union within one week. In recent months many Baha’is have been arrested and released without charge in a pattern of activity that is feared to be intended to further harass the Baha’i community, a full report of the situation the Baha’is currently face in Iran can be found here. Meanwhile, following the disturbing discovery of this confidential correspondence, the worrying plight of the Iranian Baha’is has been brought to the attention of governments and media around the world who have spoken up in their defence. The Baha’i World News Service story quotes responses from, among others, a spokesman for the President of the United States, the Council of Europe, the French Foreign Affairs Minister, the Spanish House of Representatives and the House of Representatives of the Philippines. On 18th June 1983 ten women (pictured above), one of whom was only 17 years old, were executed in Iran for teaching Baha’i children more about their Faith. 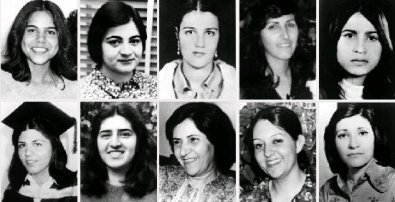 They were among more than 200 individuals who were killed in Iran for being Baha’is but their story has stood out throught the years as they were all women and many of them are very young.Shirin Dalvand, pictured bottom left, was 25 years old when she was executed, Shirin was Ladan’s aunt and, while Baha’is beleive it an honour to die for your beliefs, Ladan has always been very upset about the loss of her aunt. Ladan was only seven at the time of Shirin Dalvand’s execution, it is hard enough as an adult to attempt to comprehend that a government should seek to kill people on basis of their religion. Sadly there are renewed fears over the safety of the Baha’is currently living in Iran, following an instruction from Ayatollah Khamenei that all Baha’is living in Iran should all be identified and their activities monitored. In Newcastle we decided, at the last minute, to hold a devotional meeting to commemorate the lives of those martyred in Iran, including Shirin, and to pray for the safety of those Baha’is living there now. In spite of the very short notice there was good attendance, and the basic programme of a few prayers and a little music and video was very moving. NEW YORK, 26 May 2006 (BWNS) After their arrests on 19 May in Shiraz, Iran, three Baha’is remain in jail while 51 others have been released on bail. No indication has been given as to when the three will be released. None of those who had been released, nor the three who are still being detained, have been formally charged. On the day of the arrests, one Baha’i, under the age of 15, was released without having to post bail. At that same time, several other young people who are not Baha’is and who had been arrested with the Baha’is, were also released without bail. On Wednesday 24 May, five days after their summary arrests, 14 of the Baha’is were released, each having been required to provide deeds of property to the value of ten million tumans (approximately US$11,000) as collateral for release. The following day, Thursday 25 May, 36 Baha’is were released on the strength of either personal guarantees or the deposit of work licenses with the court as surety that they will appear when summoned to court. Friday 19th May, Shiraz, 54 Baha’is were arrested while carrying out a local project in schools with permission of the Islamic Council of Shiraz. The charges are not yet clear but the arrests are all the more concerning due to the facts that most of those arrested are youth and this is one of the largest number of Bahá’ís taken at once since the 1980s. Several non-Bahá’í youth who were also involved in the project have been permitted to go free. The Bahá’í World News Service has today (May 24th) officially reported that only one younger Bahá’í has been freed in addition to all of the non-Bahá’í participants, this disturbing confirmation follows unconfirmed reports that all the Bahá’ís had been released. Representatives of the Baha’i International Community reacted with alarm today to a United Nations official’s statement about actions of the Iranian government against the Baha’is in Iran. “The Special Rapporteur’s concern that such information could be ‘used as a basis for the increased persecution of, and discrimination against, members of the Baha’i faith’ is clearly well-founded,” said Ms. Dugal. The statement of the Special Rapporteur on Freedom of Religion or Belief about recent actions taken by the Government of Iran concerning the Baha’is arouses grave apprehension in the Baha’i International Community about their fate. The Baha’is have been the victims of an unrelenting persecution ever since the revolution of 1979, and one hesitates to think of what horrors could be implied by the combined effort of intelligence, military and police agencies to identify Baha’is and monitor their activities, as has been ordered by the Chairman of the Command Headquarters of the Armed Forces at the direction of the Head of State. We are dreadfully afraid for the lives of our fellow Baha’is in Iran. Because of the unprecedented character of the Government’s action, we are addressing a request to the Ambassador of Iran for an explanation. Such actions come in the midst of mounting media attacks on the Baha’is, the nature of which in the past have preceded government-led assaults on them. “Kayhan,” the official Tehran daily newspaper, has carried more than 30 articles about the Baha’is and their religion in recent weeks, all defamatory in ways that are meant to create provocation. Radio and television programs have joined in as well with broadcasts condemning the Baha’is and their beliefs. We know what hateful propaganda can lead to; recent history offers too many examples of its horrific consequences. We make an urgent plea to all nations and peoples on behalf of our Iranian coreligionists that they not allow a peace-loving, law-abiding people to face the extremes to which blind hate can lead. The ghastly deeds that grew out of similar circumstances in the past should not now be allowed to happen. Not again. In recent months, Iranian newspapers and radio stations have been conducting an intensive anti-Baha’i campaign. From September through November 2005 alone, the influential, state-run “Kayhan” newspaper ran nearly three dozen articles defaming the Baha’i Faith with the clear intention of arousing in readers feelings of suspicion, distrust and hatred for the Iranian Baha’i community. The articles engage in a deliberate distortion of history, make use of fake historical documents, and falsely describe Baha’i moral principles in a manner that would be offensive to Muslims. Before the onset of previous government campaigns of persecution against Baha’is, such as in 1955 and 1979, similarly defamatory articles and radio programs were run against the Baha’is, stirring up animosity and prejudice, apparently to prepare the public for what was to come. For more information, including copies of the “Kayhan” articles in Persian and summaries in English, please click here. Founded in 1953 as a specifically anti-Baha’i organization by a charismatic Shiite Muslim cleric, the Hojjatieh Society has today reemerged in Iran as an influential if secretive faction that has been linked in news articles and Web blogs with the current Iranian administration. During the 1979 Iranian revolution, the Society played an important role in stirring animosity against Baha’is. However, in part because of differences in theology — among other things the Hojjatieh believe a truly Islamic state cannot be established until the return of the 12th Imam — the Society fell into disfavor and was banned by the regime in 1984. Outside observers have connected the Society’s reemergence with the return of hardliners to positions of power in the government, including the president who has frequently stated his expectation that the 12th Imam will return soon. For more information on the Hojjatieh, please click here.